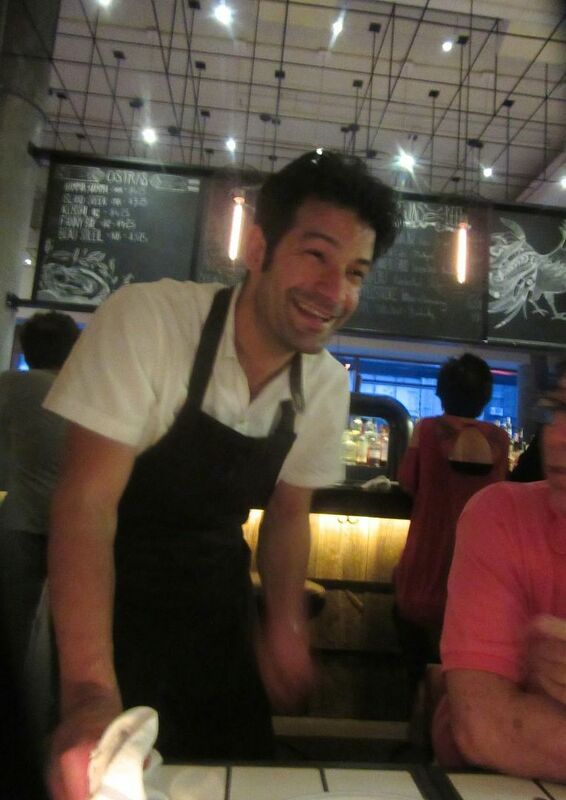 With the instant success of his new Lupulo, Chef George Mendes can usually be seen at the grill. Where do I eat when I’m not hustling to find something to review? Here’s where I’m going right now, just for fun, because it feels special, and maybe also, to impress a friend. 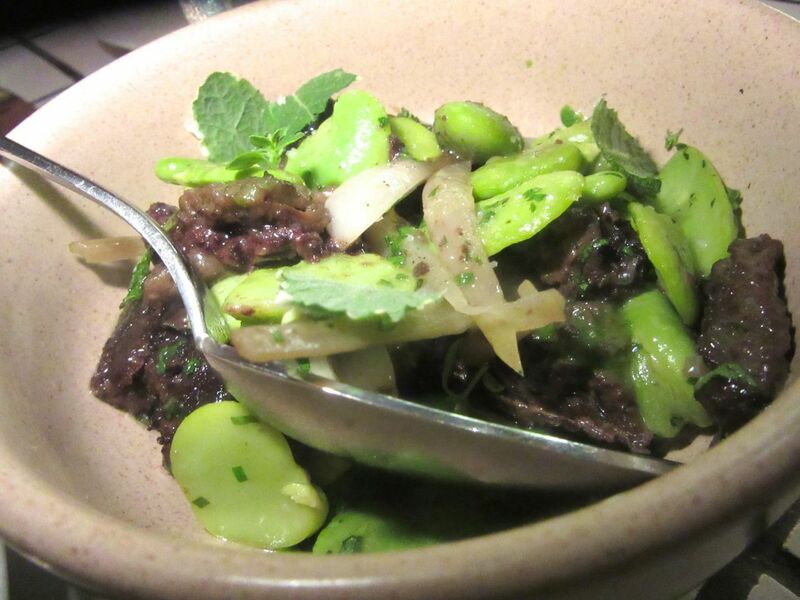 Season bliss, blood sausage in a toss with favas, ramps and morel mushrooms. It must be love. I was sitting at a far corner near the kitchen at George Mendes lively new Lupulo two Fridays in a row and with the same two friends. The lofty tavern with it’s good-looking blue-and-white tile, rope dividers and wrought iron fairly vibrates with good cheer from the rotating full house. Another way of saying “noisy.” And George himself is on the run everywhere. 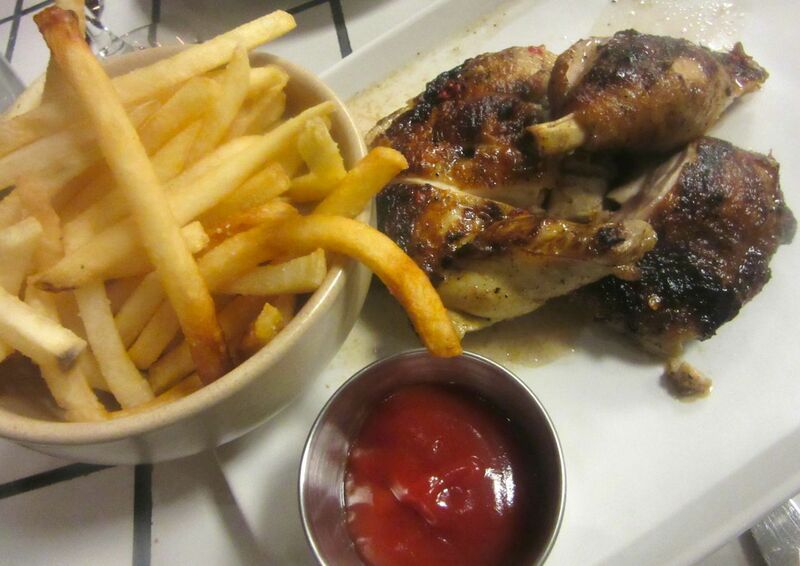 Butterfield chicken crisply fried over the embers with very good fries and hot piri piri sauce. But it’s the small Portuguese dishes, mostly coming off the wood-burning grill that brings me back again -- the charred cucumber and razor clam salad, grilled green asparagus with sea urchin, sorrel and walnut, the blood sausage in a toss with favas ramps and morels. Not to mention the dense Portuguese bread from Newark to mop up the last drop of sauce. I don’t mind at all that, depending on what you order, you can put together a modestly priced dinner. The shrimp porridge with a soft hen egg is enough for the table to share. And, amazingly, a $14 half of chicken -- marinated his Mom’s way, butterflied and charred crisp – with a fiery piri piri pepper sauce -- is also enough for four. 835 Sixth Avenue between 29th and 30th streets. 212 290 7600. 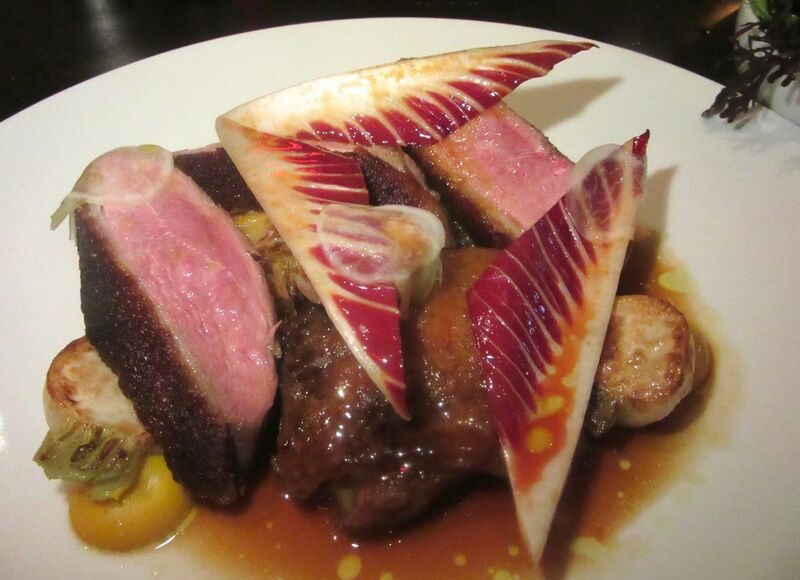 Rare duck breast with sauce a l’orange under triangles of fennel and endive. My idolizing of Ian Schrager, the perfectionist hotelier, and my longstanding delight in David Rockwell’s design lured me to The Clocktower as soon as it opened. (Read my review by clicking here.) The good-looking youths at the door, the exaggerated welcome, and the extravagant show of black and white photography on the walls – artists in the bar, music idols in the billiard room, cultural icons in the blue room – conspired to temper critical defenses. I was impressed that Schrager had enticed seasoned restaurateur Stephen Starr to partner with the British star chef who would ultimately be going home to his many Michelin-starred tables, leaving his right hand number two behind. Of course you would expect outstanding dover sole from a London chef. But it’s Jason Atherton’s English food, the scrumptious rye bread and buttermilk-infused butter, and his witty, imported, tabletop touches – the death’s head plate for the steak, the collection of chicken-shaped gravy boats – that bring me back again now for my own pleasure. I like the raw diver scallops, Alaskan king crab, and chicken with white asparagus (best at the height of fat white asparagus season). Not-Exactly-Mom’s macaroni with morels, the duck on sauce a l’orange, and the chicken for two linger in my mind as dishes I must repeat, although at a recent dinner my friend and I each had the burger with bacon, cheddar and Churchill sauce (ketchup and mayo by a grander name). The fat soggy chips were better cooked extra-crisp as demanded. 5 Madison Avenue, entrance on East 24th Street. 212 413 4300. 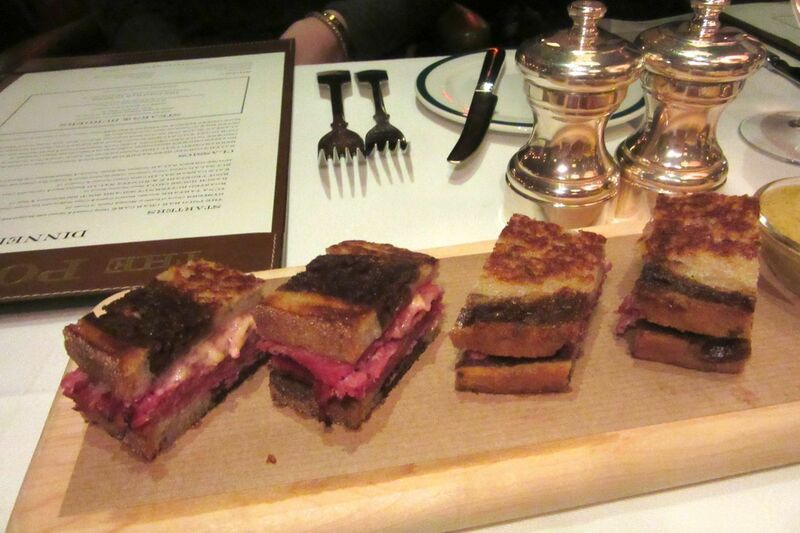 VIPS usually get an amuse of Ralphs’ favorite corned beef sandwiches in small cuts. Lauren opened his first Polo Bar because he couldn’t get a burger in Paris, reason to go for it. The food is not the point, but it’s not bad at all. And I like what Ralph likes to eat, the cheese-infused popovers, the overstuffed corned beef sandwich, the Ranch House chili with a pecorino biscuit, a phyllo-crusted crab cake, the iceberg wedge, the good-enough chicken and a salty bone-in rib eye. 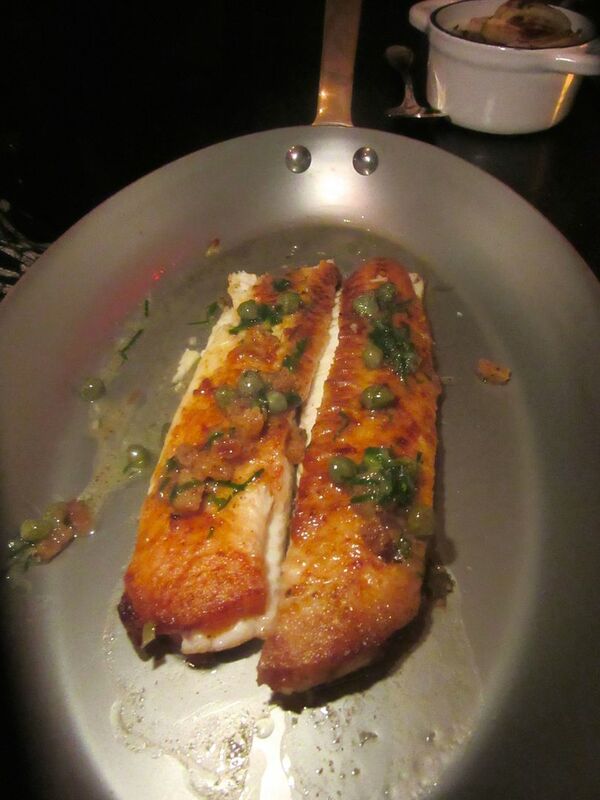 My friend who is almost a regular always orders the Dover sole. I impressed a pal visiting from Aspen by scoring a table recently and we both had towering burgers with unusually good fries. Ralph understands desserts too: I love the walnut-studded brownie with warm chocolate sauce poured on, and his idea of apple pie. On summer weekends when regulars disappear to the Hamptons, you might see some curious-looking everyday types in tank tops. Sorry about that. 1 East 55th Street between Fifth and Madison. 212 207 8562. The Cecil Chef J. J. Johnson confesses he sent out the macaroni-and-cheese the way I wanted it. 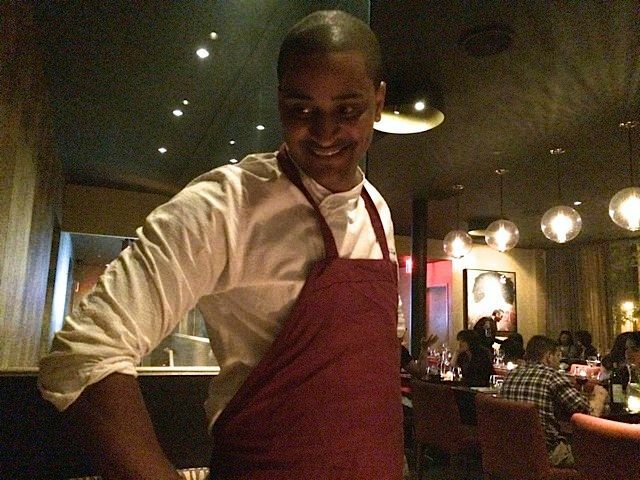 I’ve never taken anyone to The Cecil in Harlem who didn’t succumb to its look -- the diverse crowd of downtowners and locals -- and the African-Asian-Low Country menu dreamed up by managing partner Alexander Small and delivered by chef J.J. Johnson. (Click here to read my first review.) I stopped going for a while when the house cruelly reduced the size of the “small” macaroni and cheese. But I couldn’t stay away. On my most recent visit, I persuaded my friends to let me order the chef’s new dishes. 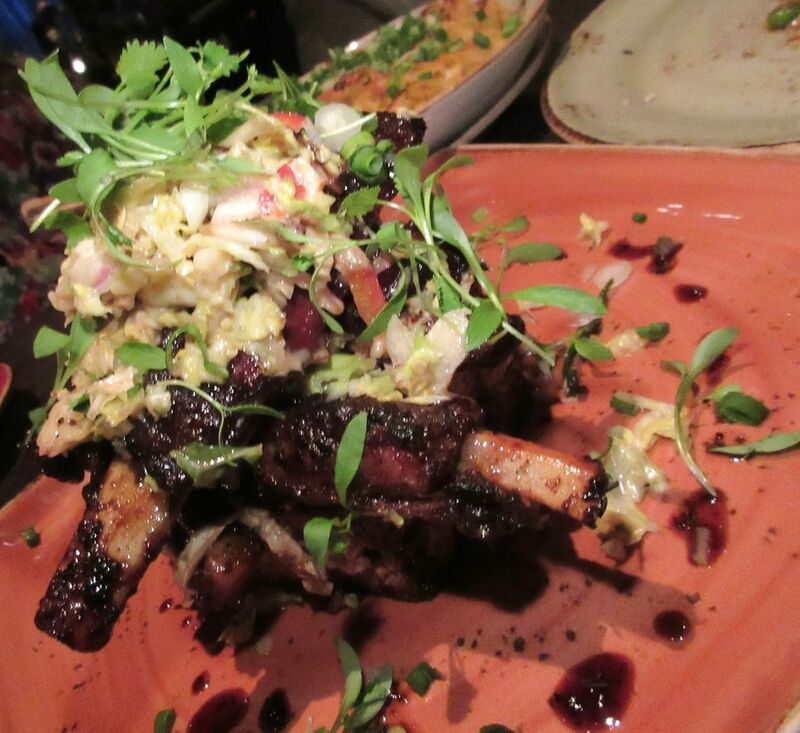 Grilled hibiscus-glazed St. Louis ribs with blue cornmeal cake is an excellent addition to the menu. Some of those we tasted had a confusion of too many ingredients. The giant pork dumpling with grilled peaches was a bit overwrought, but we liked the lamb carpaccio with silken tofu sauce, and the mussels in a tangy stew of duck sausage, with roti and a powerful dose of yuzu. Both the sweet and smoky duck with English peas and the meaty and chewy St Louis ribs on blue cornmeal cake were hits. Of course, I had to have the house’s crusty mac’n’cheese. The chef sent it out as his gift in a large clay casserole as I remembered it, enough for all of us to share. I can’t guarantee yours will look the same. As a finale, the four of us divided a delicious small coconut tart with sweet potato ice cream and dollops of yuzu curd. 210 West 118th Street at St. Nicholas Avenue. 212 866 1262. 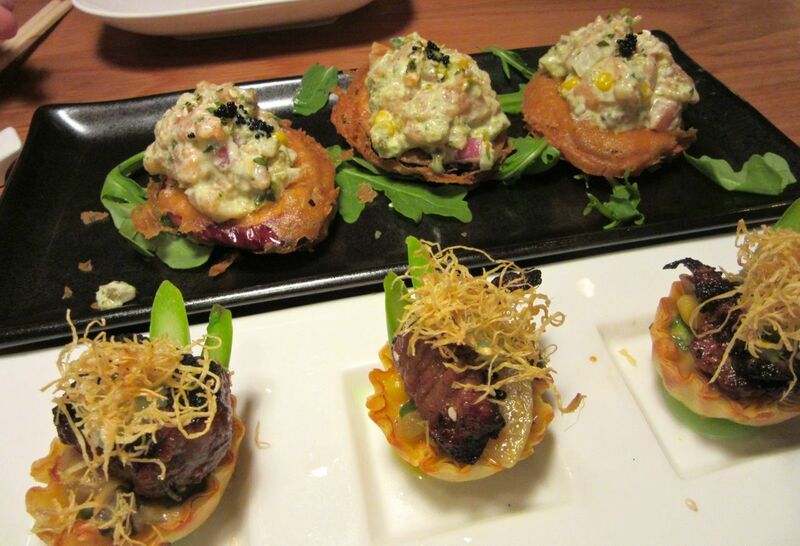 Smoked salon-eggplant bruschetta and filet-mignon tarts show Chef Ng’s dim sum mastery. Shrimp-stuffed chicken is a banquet dish but Joe Ng’s version is uniquely wonderful. I must have smoked salmon eggplant bruschetta – the crisp chip of fried eggplant stands in for the toast. Then depending on whether my companions are vegetarian or not, I order the shrimp and snow-pea-leaf dumpling, the lamb shooters, vegetable-peanut dim sum and Shanghai soupy buns. If my guest is a guy, I feel I must let him try Katz’s pastrami egg roll. (I, myself, try to avoid anything fried.) 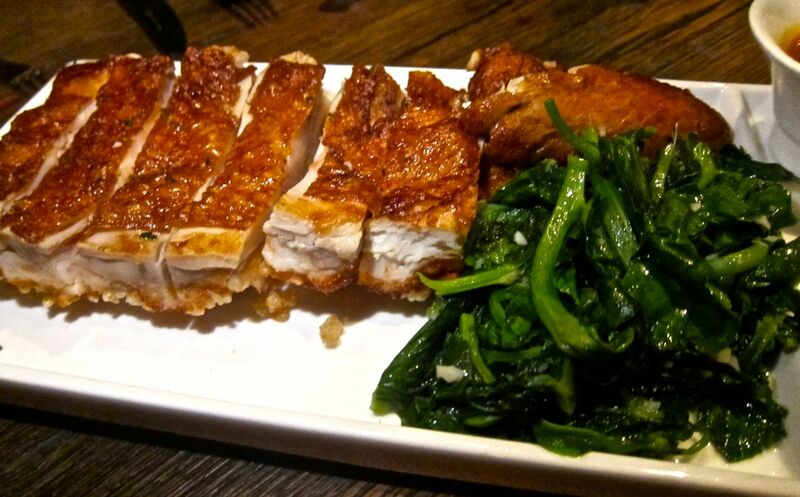 Since I discovered the chef’s sublimely crispy shrimp-stuffed chicken, that’s become my entrée. I let my guest choose a vegetable dish: If they insist on noodles, I push for wide rice noodles with BBQ duck. 2170 Broadway between 76th and 77th streets. 212 724 9700. 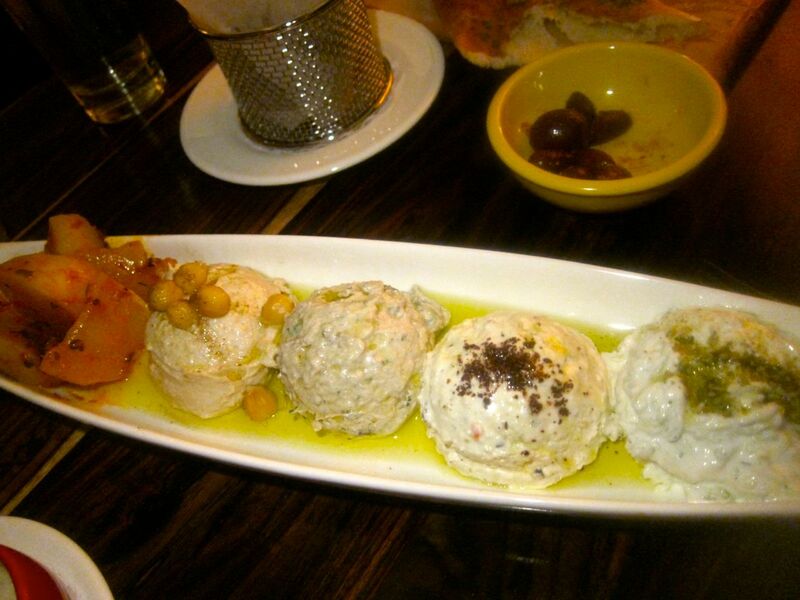 Dinner at Bustan must begin with the mazettim spreads – I especially like eggplant, the tzatziki and spicy feta. 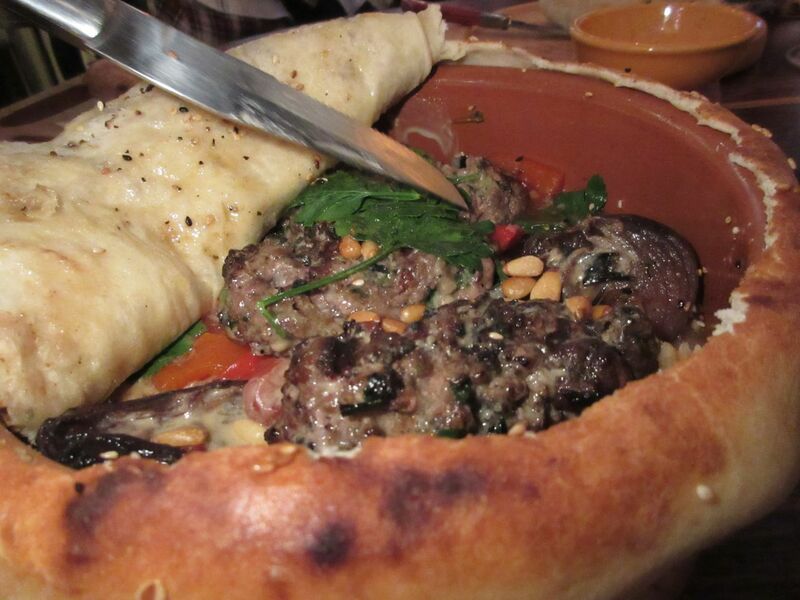 Lamb kebabs with caramelized onion, tomato and pignolis baked under a pita is so rich, it easily feeds four. I can’t imagine launching a meal here without a row of classic Middle Eastern spreads -- called mezettim on the menu -- smoked eggplant, spicy feta, tzatziki, and taramasalata -- to pile on oily pita warm from the taboon. I often order three spreads. My favorite waiter might bring five and a second bread when the first is gone. We share a beet salad with grilled haloumi cheese, possibly the falafel basket with tahini. And for a main, chopped lamb kebabs with caramelized onion, tomatoes and pignolis baked in terracotta under a bread dome. 487 Amsterdam between 83rd and 84th Streets. 212 595 5050. 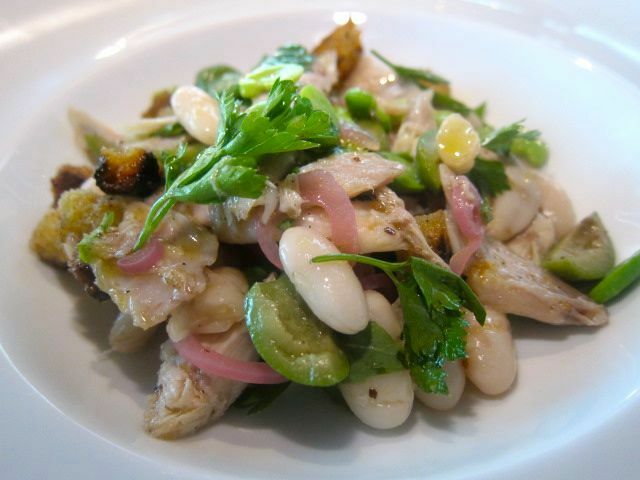 Under Chef Jonathan Benno, Lincoln’s menu constantly changes as in this rabbit salad with beans and olives. 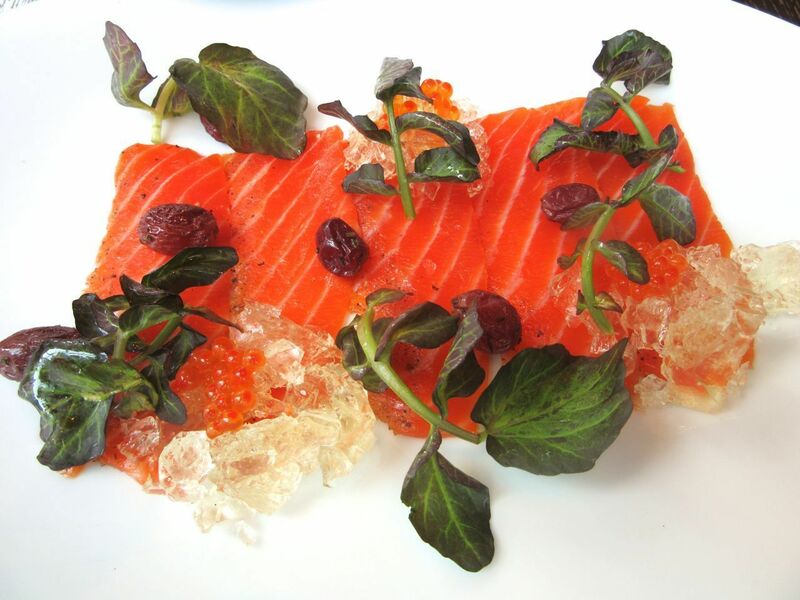 Marinated sea trout with olives, salmon roe and watercress is a thrilling still life. Each month he explores a different region of Italy. The pastas are endlessly inventive. The lamb shoulder during the last restaurant week was so thrilling, a friend and I returned and persuaded him to serve it for dinner. When I come early to eat before the theater on my own dime, I usually order an appetizer, a salad or whatever the chef is doing with polenta, and a remarkable eggplant parmigiana with buffalo mozzarella, an $18 contorni, as my main course. Once Benno sent out a polenta made from fresh corn paved all over with thin tiles of black truffle. A gift. But I promise you don’t need a gift from the chef to feel special here. Try bucatini alla trapaneze from the current Sicilian-inspired menu. Mixed gelatos and sorbetti are a dessert to share, followed by sweet tidbits from the dessert chef. Complimentary for everyone. 142 West 65th Street between Broadway and Amsterdam. 212 359 6500. 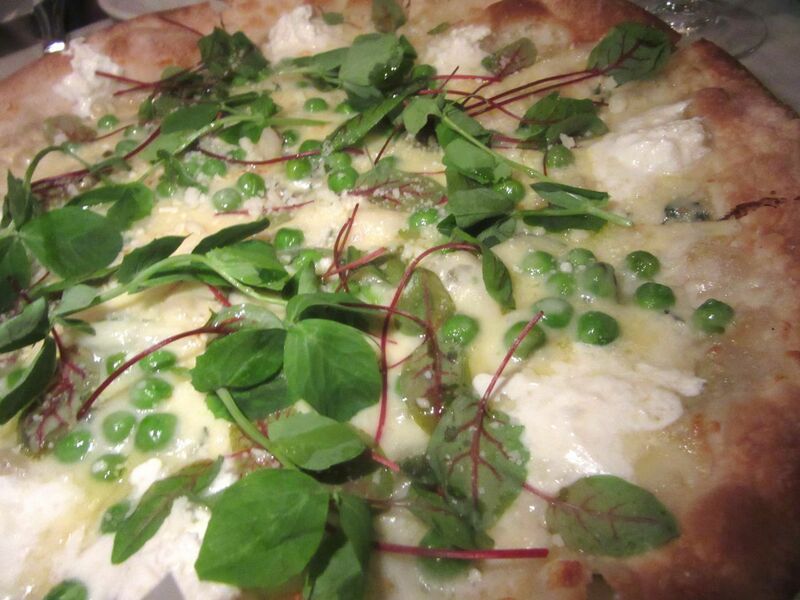 In spring a seasonal pizza should have peas, ramps and fontina like this luscious pie at Florian. I recently took fussy friends to Shelly Fireman’s new downtown trattoria-bar Florian with its great-looking marble tile and outrageous sculptures. I hadn’t been back since my first report and I was disappointed not to see the marvelous seafood soup with farro. But I sipped a classic Negroni by the outrageously handsome Francesco and ordered my favorite dishes -- the spring pizza with peas, ramps and fontina, fried artichokes alla Guidea, the artichoke calzone, lasagna ossobuco and spaghetti carbonara with a fried egg to smash into it. An uptight burrata with not enough creamy flow was the only disappointment. The made-to-order mountain of vanilla ice cream with hot chocolate to pour over it especially impressed our ice cream expert. 225 Park Avenue South between 18th and 19th streets. 212 869 8800. 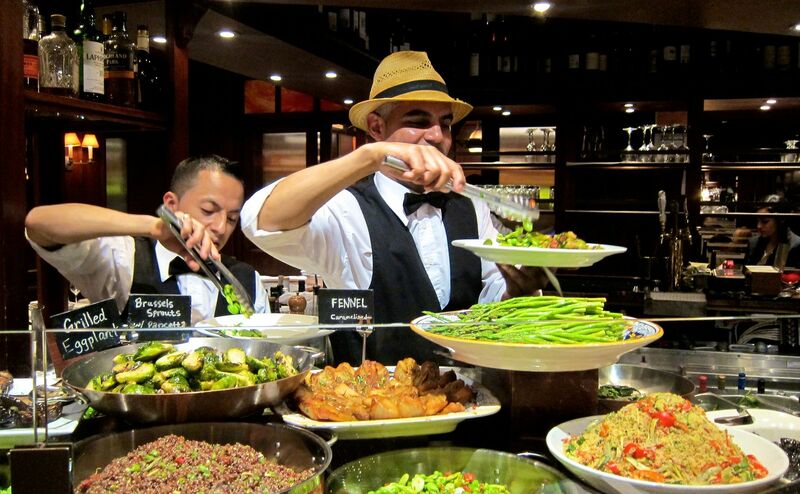 I never grow bored with putting together a vegetable plate at Café Fiorello’s antipasti display. 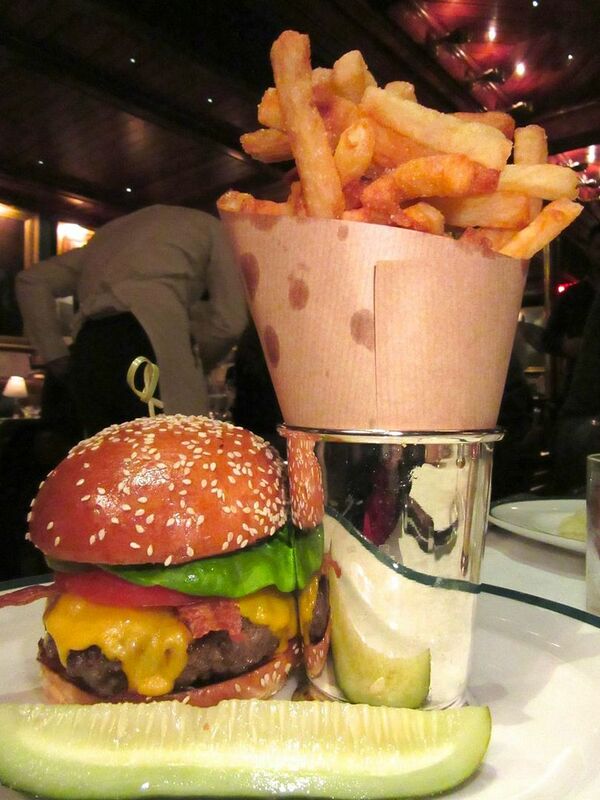 I would surely go to Florian more often, but it’s a $60 round trip cab ride from my place. You are much more likely to spot me at Fireman’s Cafe Fiorello across from Lincoln Center, especially when my niece Dana is in town: The two of us select mostly vegetables from the antipasto table. And finish with intense lemon sorbetto to clear the palate. Click here to read "Flirting with Fiorello". 1900 Broadway between 64th and 63rd streets. 212 595 5330. Before the theater my light supper at Blue Fin might include cherrystones on the half shell and sushi rolls. I’ve been going to the theater more than usual lately and I find I do better the next day with a light supper before rather than who-knows-what after a late curtain. 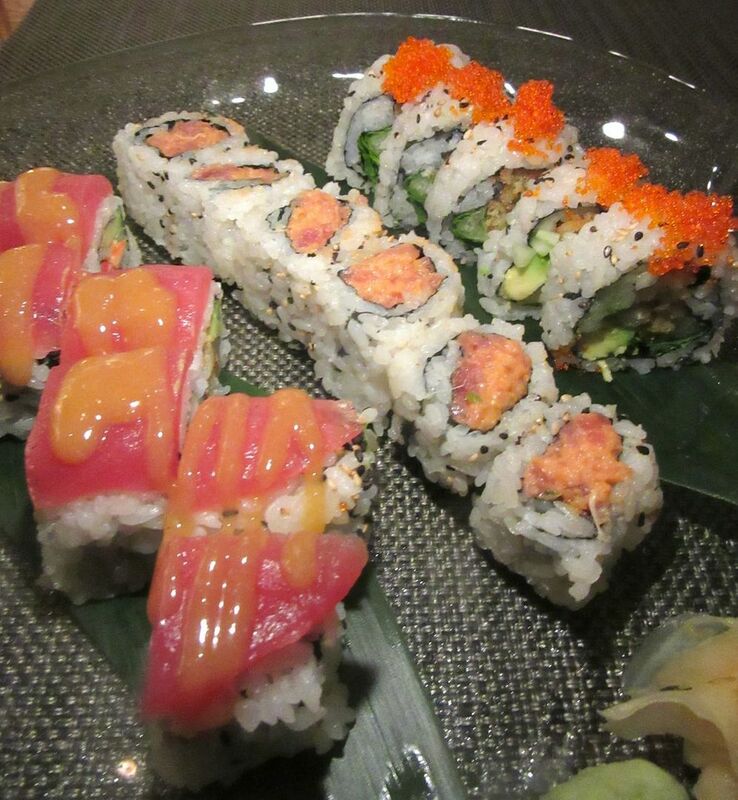 More often than not, Blue Fin is a fast walk from the theater. The last time I was there, the birds flying up the stairs had disappeared and I heard the ground floor space would reopen as Dos Caminos in fall. I love sitting near the bannister overlooking the stairs to Blue Fin where the birds fly. But meanwhile, as long as Blue Fin keeps serving, I’ll start with four Cherrystones on the half shell -- icy cold and huge. Six would be too filling. I might share steamed shrimp dumplings and shrimp and lobster spring rolls depending on the appetite of my companion. But if he’s eyeing a steak, I’ll order a couple of sushi rolls to follow, and always the spicy tuna roll. I finish with an espresso and sometimes a chocolate chip cookie still warm from the oven. I can’t say I’m thrilled to see the Blue Fin menu shrink as it has, but I’m not discouraged. 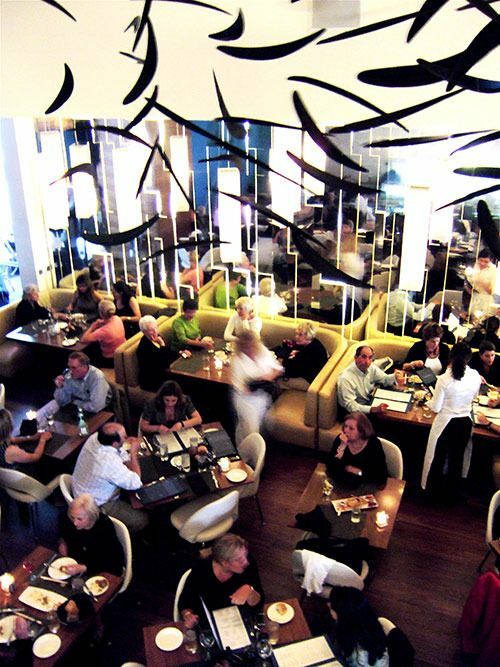 Blue Fin is scheduled to close in early September and reopen early in October. Best check before coming. 1567 Broadway at West 46th Street. 212 918 1400. The Patina Group, BR Guest and The Fireman Group are advertisers. That may be what got me to their places early, but pleasure in dining there is what keeps me coming back. Photographs may not be used without permission from Gael Greene. Copyright 2015. All rights reserved.